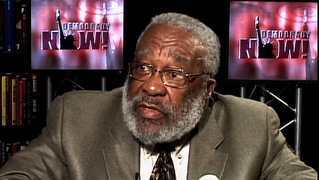 RIP Vincent G. Harding, Historian Who Co-Wrote MLK’s “Beyond Vietnam” Speech | Democracy Now! Democracy Now! has confirmed reports that first appeared on Twitter, that Dr. Vincent Harding has passed away. We will report further details as they become available. Harding was a well-known historian and scholar, and friend, colleague and former speechwriter for Rev. Dr. Martin Luther King, Jr. Harding was a Professor Emeritus of Religion and Social Transformation at Illiff School of Theology in Denver, Colorado. He wrote many books, including Martin Luther King: The Inconvenient Hero and There Is a River: The Black Struggle for Freedom in America. Harding was also the first director of the Martin Luther King Memorial Center in Atlanta, and chairperson of the Veterans of Hope project. The video above features Dr. Harding’s 2008 interview on Democracy Now! with Amy Goodman and Juan Gonzalez. We last spoke with Dr. Harding when he was 81 years old in 2012, during our “Expanding the Debate” special broadcast.